I have never had the desire to keep a gardening journal. However, my attitude towards journaling might be changing, all because of my fellow Master Gardener, Lise Jenkins. Her grandfather kept an extensive journal, listed by day and not by year. In other words, under “March 24” you would have a 2015 entry followed by a 2016 note. This piqued my interest, primarily because this year so many of my perennials are stirring a good month ahead of schedule—or what I think is a good month ahead of schedule. You see, I’m not absolutely sure when some of these perennials normally reappear. For instance, I came across a hosta that was definitely on the rebound, which surprised me. Now I have a lot of hostas and this one grows in more sun than the others so it makes sense that it should be the first one to reappear, as the soil is warmer. However, what is foggy in my brain is the approximate month that hostas typically make their appearance. Is it mid-April? Is it mid-May? I haven’t a clue. In mid-March my crinums began to stir and I know that this is a good month ahead of schedule primarily because I have an exceptionally cranky crinum, ‘Super Ellen’. For sheer drama ‘Super Ellen’ is hard to beat. I have several but one in particular is quite opinionated. One fall we cut back her scapes, only to have her retaliate by refusing to make an appearance until July. Now we know to leave her alone until she begins to stir sometime towards the end of April. My other ‘Super Ellens’ are far more pliant and if it weren’t for the cranky belle in question, I would have no idea exactly when they should begin growing. It is relatively easy to organize a garden journal as a Word document, simply adding a year to a listed day. For example I could have an entry reading: March 24, 2016: “The hosta near ‘Old Blush’ rose is halfway up, I cut back the foliage on three ‘Super Ellen’ crinums, all 40 pruned roses are leafing out beautifully with the exception of ‘Cramoisi Superieur’.” This entry would tell me to keep an eye on ‘Cramoisi Superieur’ next year: Is she naturally slow to respond to a pruning or did I take off too much? This has been a super year for my Camellia japonica ‘Jacks’. To me, this is the epitome of what a C. japonica should be—but a year from now I won’t remember how spectacular they have been this year unless I put it in a garden journal. On the other hand, my Camellia ‘Taylor’s Perfection’, which always blooms in April for me, is through with its bloom cycle—and as I write this it’s still March. Has that happened before? I have no idea—so this too will go into the journal. When will my roses bloom? Traditionally the first to bloom, ‘Old Blush’ is covered with buds—but does this mean it should bloom the first week in April? Or the second or third week? Next year I shall be able to give you an answer. Likewise my Japanese maple of unknown origins has leafed out. Surely this is early but I don’t know how early. Last year was the hottest year on record. We had a strong El Niño this past winter, giving us a warm December and lots of rain. 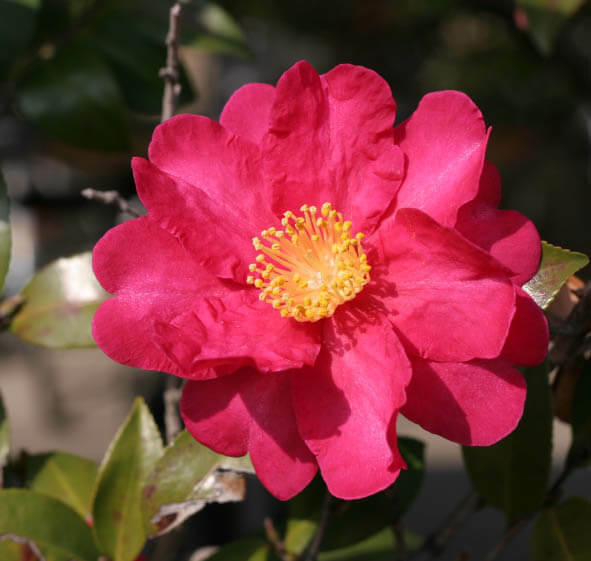 Some of my Camellia japonicas bloomed in December rather than waiting their turn to flower after the Camellia sasanquas. Is this the new normal? The only way to know is by keeping a journal. My journal entry of March 24, 2016 will be followed by March 24, 2017. This way I’ll be able to determine whether there is a new growing pattern or whether the spring of 2016 was an anomaly. So I have to thank my friend Lise Jenkins who demonstrated that this old dog can learn new tricks.